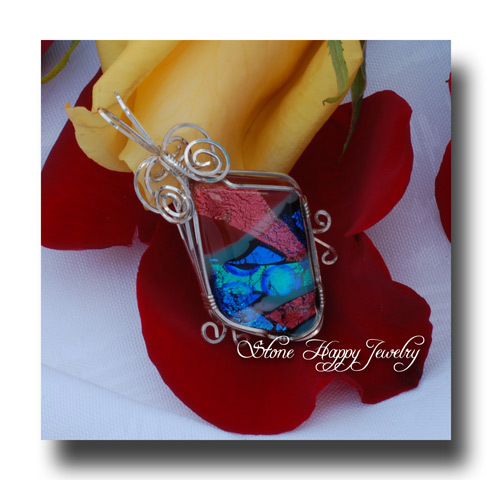 It is a one of a kind glass dicrohic (pronounced dye-crow-ic) wrapped in sterling silver. The collar is dressed up just enough to look good and not detract from the terrific colours. As with really good dichroic as this is, it changes quite a bit as you look at it from different angles and under different lights. Great fun and with it's small size, but just enough bling, it will work for you day and night! To help you a few of the colours in it are red, cobalt blue, turquoise, and white. The size is 2 1/4 inches (5.9 cm) by 1 1/4 inches (3.2 cm).